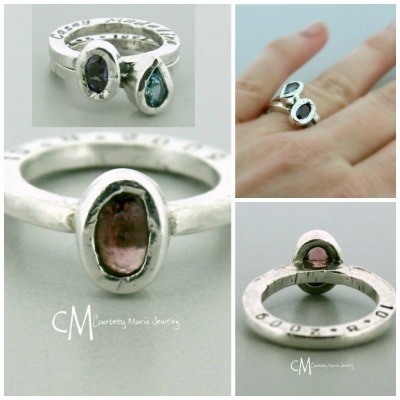 Sterling silver birthstone stacking mothers rings are a classic piece of jewelry used to identify motherhood. Whether you are looking for a push present for a new mother, a Mother’s Day gift, or simply a ring for a mother who sacrifices day in and day out for her children these sterling silver stacking rings are simple and sophisticated. Handcrafted in the style of a stacking ring, you can easily stack up to four of these types of rings onto a finger. The purchase of this listing includes ONE custom sterling silver stacking ring with a 7x5mm oval shaped gemstone of your choosing. These sterling silver stackable rings are available in sizes ranging from US 4 – 12. These custom rings can also be hand stamped with up to 18 characters on each side. Production time for this ring is up to 4 weeks. Please contact me if you are needing it by a certain date to be sure I am able to meet your deadline.